Received March 16, 2018; Revised May 3, 2018; Accepted June 7, 2018. Unstable pelvic ring lesions are usually treated with internal fixation. In patients presenting clinical instability or soft tissue complication risk, external fixation is a safe treatment option. However, pin tract infection, insufficient biomechanical properties, difficulty sitting and changing decubitus are important drawbacks related to the treatment. The present study reports the association of anterior and posterior subcutaneous internal fixation by applying spine-designed implants on the pelvic ring disruption: supra-acetabular pedicle screws with an interconnecting rod (Infix), plus posterior transiliac fixation with the same system, which the authors have named the “Hula Hoop Technique”. Unstable pelvic ring injuries are rare, but as they result from high-energy trauma and present in very complex conformations, they are still considered one of the most challenging lesions to the orthopedic surgeon. Open reduction and internal fixation remains the standard treatment for anterior pelvic ring reconstruction, mainly for pubic symphysis diastasis. In case of comminuted and complex anterior lesions, in which plating is technically more demanding, external fixation is an alternative. For posterior lesions, iliosacral screws are the choice for most cases . However, in severe sacral dysmorphism or comminution, iliosacral screws are unsuitable, so other options are required, such as transiliac plates, transiliac bars, or lumbopelvic fixation for bilateral sacral fractures . Therefore, some patient conditions represent relative or absolute contraindications for open reduction and internal fixation of the anterior or percutaneous screws placement of posterior pelvis. External fixation is a viable treatment for these conditions of the anterior pelvis and some other indications include open pelvic fractures, colostomy near the approach to the internal fixation, delayed treatment of associated urologic injuries, complex pubic rami fractures, refractory coagulopathy, and certain previous pelvic and abdominal surgeries [3–6]. External fixation disadvantages include insufficient biomechanical properties, difficulties sitting and changing decubitus, and pin tract infection ranging from 2–50% [7–12]. Due to these drawbacks, some authors have reported using safely an anterior subcutaneous internal fixation with pedicle screws placed on the supra-acetabular corridor with a cross rod, known as the Infix technique, on the bikini area . Dienstknecht et al. used the same spine-designed implants for posterior fixation by applying transiliac pedicle screws with a subcutaneous interconnecting rod (transiliac internal fixator, TIFI), which seems to be more stable and suitable for this purpose, if compared if transiliac plates or bars . The present study aims to report the combination of anterior and posterior subcutaneous fixation using spine-designed implants in such cases, in which a bridging technique is required. The authors believe anterior and posterior fixation using this minimally invasive procedure brings sufficient biomechanical stability with the additional advantage of low soft tissue complication rates. Additionally, using the same fixation system would simplify the logistics at the operation room scenario. The “Hula Hoop” Technique emerges as an alternative option for patients with anterior open reduction and internal fixation contraindications, and patients who would benefit from external fixation. Also represents an alternative as a bridging fixation technique for posterior lesions unsuitable for iliosacral screws placement. A 52-year-old male patient involved in a motorcycle accident was admitted in the emergency room. A systematized evaluation according to the Advanced Trauma Life Support (ATLS) identified that the patient was hemodinamically stable and was clear for life threatening injuries. A head injury was recognized and neurosurgical evaluation was requested. Orthopedic exam revealed a moderate swelling, abrasion and pain during palpation of the iliac, pubic and perineal area, and limited function in lower limbs without neurovascular signs of injury. Pain and instability were also identified in pelvic maneuvers, corresponding to radiographic and tomographic images that demonstrated an unstable pelvic ring fracture (AO-ASIF 61 C1.3) with a comminuted bilateral rami fracture and a transforaminal sacral fracture (Denis type II) on the right side (Figs. 1, 2). Neurosurgical evaluation revealed a mild traumatic brain injury conducted by conservative treatment, requiring at least 24 hours of clinical observation. Since the patient was hemodynamically stable, with only an associated mild head injury, by the orthopedic point of view he was treated with rest, decubitus change and elevation as tolerated and antithrombotic prophylaxis. In 2 days, after clinical observation and pre-operatory laboratory and imaging exams, the patient presented an extensive ecchymosis in iliac, pubic, perineal, gluteus, and thigh region (Fig. 3). The patient was a former prisoner with a medical history of untreated type II diabetes, hepatitis C and drug abuse. Considering the clinical comorbidities, the higher risk of infection, the soft tissue compromise, the fracture aspect (intense anterior comminution and some dysmorphic sacral anatomy with a smaller S1 dimension) and even the contamination risk of the surgical team; a bridging system of fixation was chosen using the pedicle screw system in both anterior and posterior lesions. Informed consent was obtained and the surgical procedure was scheduled at the 6th day after lesion, when the surgical implants were available and prepared. Consented and under general anesthesia, the patient was placed in supine position on a radiolucent table. Intravenous antibiotic was administrated at the induction of anesthesia according to hospital protocol. The anterior area of the pelvis was prepared with chlorhexidine/alcohol and draped accordingly. World Health Organization pre-operative time out was performed prior to skin incision. Surgical planning was done as follows: the anterior lesion was addressed first due to its greater displacement compared to the posterior lesion in this case; moreover, if the posterior lesion was fixed before the front, it could possibly prevent the anterior reduction (Fig. 4). Two 3 cm skin incisions were performed in each side, approximately 2 cm distally and laterally of the anterior inferior iliac spine (AIIS), which could be confirmed by fluoroscopic images finding the perfect image of a “teardrop” through the obturator-outlet view (30 degrees medial and cephalic inclination of the C-arm). Careful soft tissue dissection was performed, always aiming proximal and medial, accordingly to the direction of the screw, looking for the interval between the tensor fascia lata and sartorius muscle, laterally to the inguinal ligament, taking care with the femoral lateral cutaneous nerve, which runs over this muscle, until the AIIS region. Fluoroscopic images were taken to show the safe supra-acetabular corridor (obturator-outlet and iliac oblique views). These two views are very important to confirm the position and direction of the screw through the supra-acetabular corridor and to avoid its penetration into the sacro-iliac joint (obturator-outlet view); and to check the direction and length of the screw, avoiding the greater sciatic notch (iliac view). One pedicle screw was placed at the AIIS, just above the origin of rectus femoris muscle accordingly to Vaidya et al. , through the supra-acetabular corridor in each side (6.5 mm pedicle screws, URS; Johnson & Johnson, Paoli, PA, USA). It is important to leave at least 15 mm of distance to the bone , to avoid compression of the soft tissues or possible irritation of femoral lateral cutaneous or femoral branches nerves by the rod (we left 20 mm of distance in each side). The longer the screw, the stronger the fixation is. A subcutaneous tunnel was performed at the bikini area in each side, making sure the pre-shaped rod (according to the dimensions of the patient) is maintained always palpable, subcutaneously, and not too deep; and the rod was placed until the contralateral side. In our case, where the patient was not obese, the rod could be palpable easily during all rod insertion, however, in obese individuals, it is important to make sure the rod does not penetrate the abdominal cavity or even hit the iliac vessels or femoral nerve. In such difficult cases fluoroscopy can be helpful, specially using the anterior-posterior and inlet views. In normal conditions and following these steps, all neurovascular structures stay secure, since the lateral femoral nerve runs lateral to the entry point, femoral nerve stays medially over the iliopsoas muscle which is medial to the screw; and femoral vascular bundle are located under the inguinal ligament and close to the bone, after the pectineal eminence. The only structures that stay at risk are small branches of the femoral nerve, which runs laterally and can be injured during dissection or rod insertion. The specific screwdrivers and lateral compression were helpful to achieve adequate anterior reduction. The rod was connected to the pedicle screws, cutting possible redundant existing rod segments, completing then the anterior fixation. After finishing the anterior procedure, the patient was positioned in prone decubitus. The same preparation described above was applied. Two 4 cm longitudinal skin incisions were performed just medial to the posterior iliac spines (1 cm). Soft tissue dissection until the bone was then performed, detaching erector spinae fascia between posterior iliac spines in each side. One pedicle screw was placed between posterior superior and inferior iliac spines in each side, heading to the anterior inferior iliac spine (supra-acetabular corridor). At this time, fluoroscopic images should be used to confirm the direction of the screw: obturator-outlet (the “teardrop” can be seen again to assure the right direction; and the iliac view, where the greater sciatic notch has to be avoided). A short transversal subcutaneous tunnel was created to allow rod placement to fix the pedicle screws. There was no need of osteotomy of spinous process, due to a more distal placement of the screw. In more unstable fractures, such as comminuted sacral fractures, obese patients or impossibility of anterior fixation, an additional second pedicle screw can be introduced, more proximal or distal to the first one, and a second rod can be added as well; but it was not necessary in this case. Slight compression was performed using reduction clamps, and fluoroscopy images were taken throughout the procedure to confirm the reduction and implants position. Irrigation, hemostasis and soft tissue suture was provided finishing the procedure. The whole procedure lasted 3 hours and 15 minutes, including the change of decubitus, and no blood concentrates were needed. Postoperatively, supervised range of motion exercises were carried along with crutches-assisted gait, allowing full weight bearing on the left side, and toe-touch weight bearing on the injured right side. Regular dressings and wound care were performed in the outpatient clinic until sutures were removed at 2 weeks. No wound breakage or signs of infection were identified. Weight bearing was advanced at 6 weeks and full weight bearing without crutches was recommended at 10 weeks. Physical therapy was prescribed for gait training and muscular strengthening. 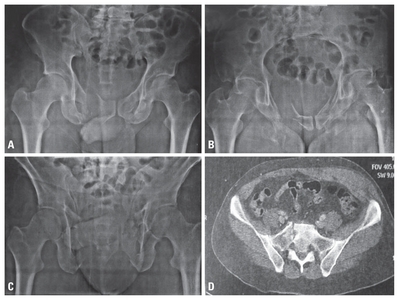 Radiographic images were taken after 2, 4, and 6 months and 1 year of the surgery (Fig. 5). Healing signals were obtained at the fracture sites, except at the superior and inferior right rami, where a persistent gap was still present. In spite of this possible nonunion, the patient revealed asymptomatic during palpation and opening maneuvers of the pelvis. Heterotopic ossification was absent on follow-up radiographs. Patient reported a numbness in the left tight that resolved spontaneously and no motor impairment was reported, as well as any complaints in urinary system or bowel frequency. Functional outcome was evaluated with the scoring system described by Majeed at 6 months, resulting in a good clinical outcome (Majeed score  of 74: pain 15; work 16; sitting 8; sexual activity 3; standing 32). Although he developed some limitation for squatting and kneeling, the range of motion of the hips and knees was normal, so this limitation was not attributed to any mechanical impingement or impact; and he could return to his previous labor activity as a personal deliverer (Fig. 6). Hardware removal has planned to be performed at the 12th month, but the patient refused it and moved to another city, then his contact was lost. Pelvic ring injuries are usually caused by high-energy trauma, and their treatment has improved over the decades. Fluoroscopy technology, special fracture tables, reduction tools, implant quality, and new surgical approaches have significantly contributed to better management of these challenging injuries, leading to satisfactory functional outcomes . Considering hemodinamically stable patients, open reduction and internal fixation remain the standard treatment for anterior pelvic ring injuries [2,17]. However, depending on the patient age, previous clinical comorbidities, soft tissues conditions and present clinical status, these approaches and long surgical procedures may increase complication rates . For hemodinamically unstable patients who also present unstable injury pattern, external fixation is the treatment of choice . Since the patient recovers clinically, external fixation is converted to an internal fixation to restore pelvis anatomy. Nevertheless, due to clinical conditions, previous comorbidities, colostomies, urinary catheters, soft tissue damage or other situations that contraindicate a demanding surgical procedure, external fixation may be the definitive treatment for anterior pelvic injuries. The major issue concerning this method is poor patient tolerance leading to frequent complaints when prolonged treatment is necessary. Usually, external fixator disrupts sitting, hinders decubitus change, and 50% of patients present pin tract infection that requires local debridement and antibiotics . The internal fixator (Infix) has recently emerged as an alternative technique when the external fixator is the treatment option for definitive treatment. Advantages of this method are low soft tissue complications, absence of disruption sitting, better biomechanical construction due to lesser rod-bone distance compared to external fixation and screwdrivers functioning as reduction tools . It is important to highlight that even in obese patients, the surgery can be simply performed at the flat location of the bikini area. Although the implants can be palpated, the majority of patients have no complaints. As drawbacks, this fixation method may require another surgical procedure for implant removal and presents the possibility to violate the abdominal cavity due to a false route of the rod. Despite several authors have reported favorable clinical outcomes using the Infix technique, the recent literature shows potentially devastating complications, especially addressed to the risk of femoral nerve palsy following the infix technique [3,22–24]. A case series of iatrogenic femoral nerve palsies following infix patients suggests that impingement on the psoas sheath may lead to femoral nerve compression, while delayed palsy could be caused by psoas engorging with blood and/or altering of pressure after changing from decubitus to standing position . This may be avoided by placing the subcutaneous rod in a position which it does not limit the space for the psoas and femoral nerve. According to Vaidya et al. , the pedicle screws must be placed 15–40 mm above the AIIS, while in obese patients this could range 30–40 mm. Meticulous surgical technique and attention to the anatomical landmarks can decrease the risks of iatrogenic lesions . Early recognition of signs and symptoms of nerve compression and prompt removal of implants are essential to minimize drastic complications that follows long term femoral neuropathy . Posterior lesions are mostly treated surgically by open or percutaneous iliosacral screws, mainly in sacroiliac joint dislocations or in simple patterns sacral fractures . This technique certainly simplifies the logistics of the whole procedure, as it can be done in the same (dorsal) decubitus, as the anterior fixation, however, in some situations iliosacral screws seems to be difficult and dangerous, as in dysmorphic bones, severely comminuted sacral fractures, small patients, and children. Some alternatives were described, such as transiliac plates, transiliac bars, computer or tomography assisted screw placement or even lumbopelvic fixation. Stimulated by the simplicity and stability of pedicle screws system, authors believe that they could be used in posterior topography with the same advantages, and simplifying the implants logistics, as the same pedicle screws set can be used. Recently and concomitantly with the Infix development, Dienstknecht et al. described the same concept for posterior pelvic ring injuries. The authors used a TIFI with the infix technique in the posterior region, bridging the sacroiliac joints and the sacral area, entering in iliac crest region, aiming around the posterior inferior iliac spine. In a review of 67 patients who underwent this technique, secondary fracture displacement greater than 5 mm was present in one patient. Less than 50 mL of blood loss was found in all patients. Absence of iatrogenic neurovascular damage occurred during screw implantation. Four patients presented wound infections, and one had a single pedicle screw loosening. Screw misplacement was observed in one patient. The authors concluded that TIFI is a reasonable treatment alternative for dorsal pelvic ring injuries with minor risks of blood loss and iatrogenic neurovascular damage. Our technique differs in some points in respect of the original one described by Dienstknecht et al. , where the pedicle screws enter in the posterior part of the iliac crest, aiming distally, to the posterior inferior iliac spine. Our entry point is between posterior superior and inferior iliac spines, aiming anterior inferior iliac spine, the same supra-acetabular corridor used by anterior screws. We believe that the screw head would disturb less the surrounding soft tissues in this area. Additionally, penetrating in this area makes possible the introduction of longer screws, enhancing fixation stability. In the present case, the longest screws available in the set were used (60 mm), although 100 mm screws could be safely applied. Therefore, the indications of this technique are situations where it is too risky to execute internal fixation in anterior lesions, due to soft tissue damage or severe comorbidities. Regarding the posterior lesions, indications are the inability for percutaneous screw fixation, due to anatomical impossibility or unsuitable fracture type, such as sacral comminution or dysmorphism. As the main advantages, this technique simplifies the implants selection logistics, since the same set can be employed at the both fracture sites, and specially regarding the posterior fixation, pedicle screws are certainly better designed for this purpose than the posterior transiliac plate, where it is necessary to model the plate to fit at the posterior pelvis. As disadvantages, can be mentioned the higher cost if the implants when compared to simple external fixators and large fragment plates; and possibly a problematic implants removal if the brand of pedicle screws are unknown, being necessary to have specific screw drivers and extractors. Although this study presents the limitation of a single case report, the authors are unaware of previous descriptions of the association of Infix and TIFI techniques to treat unstable pelvic ring injuries in patients with high complication risk. The “Hula Hoop Technique” should be considered in selected patients by an experienced orthopedic trauma surgeon and may be included as a valuable alternative in the treatment arsenal. The “Hula Hoop Technique” demonstrated to be a safe and effective treatment option for this selected case with associated anterior and posterior lesions holding local and clinical complications. A larger patient series with longer follow-up is necessary for further and precise conclusions concerning where and when this technique could be safely indicated, while decreasing complication rates and improving functional outcomes. Fig. 1. Radiographic images in anterior-posterior (A), inlet (B), and outlet (C) views showing (AO 61 C1.3) fracture pattern. CT-Scan axial image identifies the sacral fracture (D). CT: computed tomography. Fig. 2. 3D CT-Scan images (A–D) confirming the anterior and posterior involvement of the pelvic ring. CT: computed tomography. Fig. 3. Clinical exam after 2 days of injury revealed an extensive ecchymosis in iliac (A), pubic (B), gluteus and perineal region (C, D). Iorio JA, Jakoi AM, Rehman S. Percutaneous sacroiliac screw fixation of the posterior pelvic ring. Orthop Clin North Am 2015;46:511-21. Halawi MJ. Pelvic ring injuries: surgical management and long-term outcomes. J Clin Orthop Trauma 2016;7:1-6. Gardner MJ, Mehta S, Mirza A, Ricci WM. Anterior pelvic reduction and fixation using a subcutaneous internal fixator. J Orthop Trauma 2012;26:314-21. Routt ML, Simonian PT, Defalco AJ, Miller J, Clarke T. Internal fixation in pelvic fractures and primary repairs of associated genitourinary disruptions: a team approach. J Trauma 1996;40:784-90. Lerner A, Fodor L, Keren Y, Horesh Z, Soudry M. External fixation for temporary stabilization and wound management of an open pelvic ring injury with extensive soft tissue damage: case report and review of the literature. J Trauma 2008;65:715-8. Bellabarba C, Ricci WM, Bolhofner BR. Distraction external fixation in lateral compression pelvic fractures. J Orthop Trauma 2000;14:475-82. Lindahl J, Hirvensalo E, Böstman O, Santavirta S. Failure of reduction with an external fixator in the management of injuries of the pelvic ring. Long-term evaluation of 110 patients. J Bone Joint Surg Br 1999;81:955-62. Tucker MC, Nork SE, Simonian PT, Routt ML Jr. Simple anterior pelvic external fixation. J Trauma 2000;49:989-94. Majeed SA. External fixation of the injured pelvis. The functional outcome. J Bone Joint Surg Br 1990;72:612-4. Mears DC, Fu FH. Modern concepts of external skeletal fixation of the pelvis. Clin Orthop Relat Res 1980(151):65-72. Wild JJ Jr, Hanson GW, Tullos HS. Unstable fractures of the pelvis treated by external fixation. J Bone Joint Surg Am 1982;64:1010-20. Riemer BL, Butterfield SL, Diamond DL, et al. Acute mortality associated with injuries to the pelvic ring: the role of early patient mobilization and external fixation. J Trauma 1993;35:671-5 discussion 676–7. Vaidya R, Colen R, Vigdorchik J, Tonnos F, Sethi A. Treatment of unstable pelvic ring injuries with an internal anterior fixator and posterior fixation: initial clinical series. J Orthop Trauma 2012;26:1-8. Dienstknecht T, Berner A, Lenich A, Nerlich M, Fuechtmeier B. A minimally invasive stabilizing system for dorsal pelvic ring injuries. Clin Orthop Relat Res 2011;469:3209-17. Füchtmeier B, Maghsudi M, Neumann C, Hente R, Roll C, Nerlich M. The minimally invasive stabilization of the dorsal pelvic ring with the transiliacal internal fixator (TIFI)--surgical technique and first clinical findings. Unfallchirurg 2004;107:1142-51. Vaidya R, Oliphant B, Jain R, Nasr K, Siwiec R, Onwudiwe N, et al. The bikini area and bikini line as a location for anterior subcutaneous pelvic fixation: an anatomic and clinical investigation. Clin Anat 2013;26:392-9. Majeed SA. Grading the outcome of pelvic fractures. J Bone Joint Surg Br 1989;71:304-6. 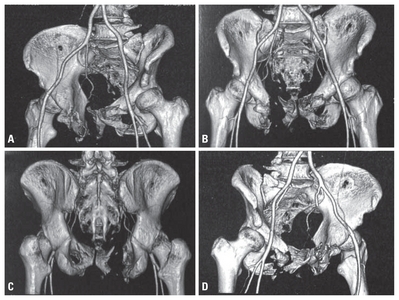 Wong JM, Bucknill A. Fractures of the pelvic ring. Injury 2013;13:556-61. Cole PA, Dyskin EA, Gilbertson JA. Minimally-invasive fixation for anterior pelvic ring disruptions. Injury 2015;46 Suppl 3:S27-34. Rudloff MI, Triantafillou KM. Management of pelvic ring injuries in unstable patients. Orthop Clin North Am 2016;47:551-63. Mason WT, Khan SN, James CL, Chesser TJ, Ward AJ. Complications of temporary and definitive external fixation of pelvic ring injuries. Injury 2005;36:599-604. Vigdorchik JM, Esquivel AO, Jin X, Yang KH, Onwudiwe NA, Vaidya R. Biomechanical stability of a supra-acetabular pedicle screw internal fixation device (INFIX) vs external fixation and plates for vertically unstable pelvic fractures. J Orthop Surg Res 2012;27:31. Chaus GW, Weaver MJ. Anterior subcutaneous internal fixation of the pelvis: placement of the INFIX. Operative technique in Orthopedics 2015;25:262-9. Hesse D, Kandmir U, Solberg B, Stroh A, Osgood G, Sems SA, et al. Femoral nerve palsy after pelvic fracture treated with INFIX: a case series. J Orthop Trauma 2015;29:138-43. Vaidya R, Kubiak EN, Bergin PF, Dombroski DG, Critchlow RJ, Sethi A, et al. Complications of anterior subcutaneous internal fixation for unstable pelvis fractures: a multicenter study. Clin Orthop Relat Res 2012;470:2124-31.